Over the years, Terrace Bay has grown to be known for its excellent waves and secluded location on Lake Superior. Surfing enthusiasts come from all over the region to enjoy the sport year round! This page is dedicated to providing information to keep surfing enthusiasts informed and safe. As this page continues to grow, we would love to hear from you about any ideas you have to help us improve it! You can get in touch with us at: info@terracebay.ca! This compiled information is more relevant for surfing enthusiasts unfamiliar with the waters of Lake Superior. On average, during the summer months, the temperatures in Lake Superior are around 4 ºC or 40 ºF, but are swimmable at specific beaches where the water is shallow. Unfortunately, Terrace Bay Beach, Pumphouse Beach and Hydro Bay are not warmer places in the Lake to swim/surf unprotected. 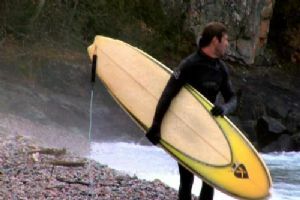 Please bring the appropriate gear for surfing in cool and cold temperatures! These excellent pictures were provided to us by visiting surfer, Amy Kukkee, of ARossi Co. Photography. All rights to the pictures remain with the photographer. Do you have a fantastic picture or video you’d like to share with us or have featured on the page? Please let us know at: info@terracebay.ca!